Pumpkin Spice Latte seems to be the craze this year! I can only tell you one cup isn't ever enough. With prices so high, you can make it home in a slow cooker in a few hours and leftovers are great reheated! Perfect for Fall and Parties! If you are looking for a delicious latte that will warm you up that shouts fall, this is it! This slow cooker pumpkin latte is perfect for fall parties, Halloween and anytime all winter long to warm and comfort you. The delicious taste of pumpkin and cinnamon will stay warm all day long or throughout the night for that special get together for guests. Why pay so much more this delicious fall drink when you can make it yourself. I love getting this ready the night before and then I have it all day long ready to drink. It's so easy and inexpensive. I love to add a dollop of whipped cream on top and sprinkle it with cinnamon and sugar. My kids love it with whipped cream and a little ice cream topping of caramel drizzle. You can even add hot fudge to your cream. 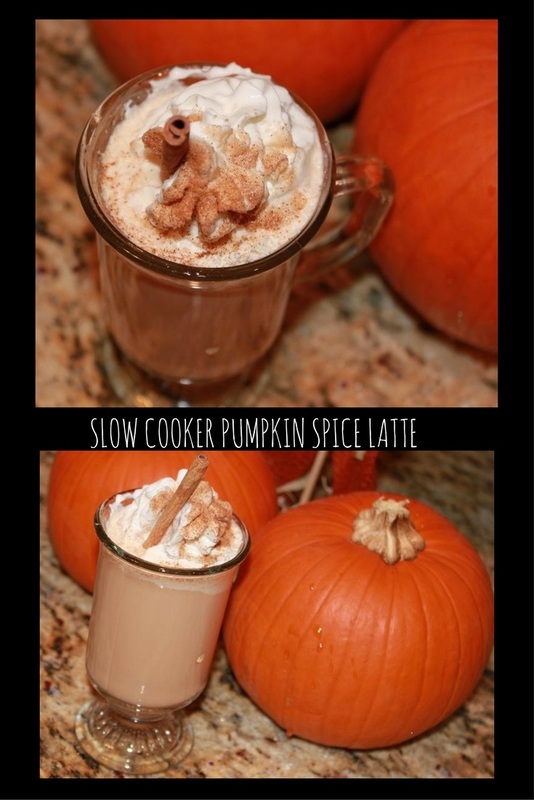 Slow Cooker Pumpkin Spice Latte has a unique flavor of coffee, pumpkin and spice. If you are a lover of flavored coffees, you will be over the moon with this easy slower cooker version. We make it all winter long and never tire of it. I used a 5 quart slow cooker, but you can use whatever you have, as small as a 1.5. This makes two huge mugs. Add the coffee or espresso with the milk to the crockpot. Whisk in the pumpkin, spices, sugar, and vanilla. Pour into mugs ith a soup ladle, and garnish with whipped cream, cinnamon sugar and cinnamon sticks. Optional: add a shot of cinnamon schnapps to the top of latte before adding the cream. This recipe can be doubled or tripled. I made a triple batch for 10 people that had at least two cups a piece. For using up the extra pumpkin, try these mini pumpkin turnovers... or best ever mini pumpkin whoopie pies with chocolate chip filling. I just may have to make this for my Halloween party!!! I would love to start my morning off with one of these. What a fun recipe, Claudia! I am bookmarking this for a Saturday morning - I can smell the aroma. Oh Claudia - you do have a way with crockpots. I don't use mine nearly enough. Now this is one great way to start off the holiday! This is incredible, Claudia. I fear I would sit myself in front of that crock pot and serve myself over and over. They look heavenly. delicious - appealing - satisfying - unbelievable - sinful ... what else? What a great idea for parties! And I also like the cinnamon schnapps topper! Yum. These look delicious and perfect for Fall. wow,so delicious !perfect for a fall party! Oh wow, what a cool combo! Can't remember anymore, did you make this last fall? ^_^ Hope you're having a great weekend. I have two pumpkins on the counter call out to be included in this Latte Claudia. Besides, it's the perfect inspiration to break out my Crockpot! I love this one. Will have to give it a try! I whipped this up tonight for a dinner party with the addition of pumpkin pie spice and extra cinnamon. What a hit! Absolutely delicious and looked so pretty in the little glass cups. Thanks for posting. With many cold nights ahead, this will be a favorite. I have never been tempted to stray from my cup of hot, black and strong coffee......until now!!! This really does look and sound incredible Claudia! LOVE the suggestion of the cinnamon schnapps on top! Looks great Claudia! This sounds so incredibly good! I love fancy coffee drinks! Claudia your Pumpkin Spice Latte looks so good. I have been wanting to come over and read your recipe since you sent me the photo, but I'm just now getting enough time to read through it. Believe it or not I've never had a Pumpkin Latte and it's going to be my mission to make as many as possible before pumpkin season is over. That latte tops my list. AND..the addition of cinnamon schnapps? - Wonderful! That looks unbelievable - really! I love my crockpot! So many great things you can make...and now I have this to add to my collection! This looks wonderful! I love the presentation! A latte made in a crock pot?!?! Brilliant! I love pumpkin spice lattes! I am so bookmarking this for the right opportunity!